I'm motivated peeps. I haven't been this motivated since taco bell took away the fresco menu at my location. This morning on my usual morning routine I headed to QT to pick up a coffee and get my roomie a diet coke (closer than Starbucks on work at home days and they have a new Pumpkin Spice flavoring that's pretty tasty). Fine, right? It was a good QT trip, even talked to a nice police officer as we joked about the fountain soda machine and wished each other good days. Then we held hands and skipped out the door together in perfect civilian/servant harmony. Okay, that didn't happen but ironically I left feeling pretty good about the nice exchange. So good in fact, I decided to pop across the street to Sonic for a little morning pick me up. This is where things go down hill rapidly. After receiving my delicious breakfast burrito (of course, what else?) I proceed home with all my morning treasures. Now, this won't mean much to you until I get the pictures and OH YES THERE WILL BE PICTURES, but the Sonic is on the corner of Sulphur Springs and Big Bend. So, to leave you can turn left on to either Sulphur Springs (an easy two lanes of traffic that is not very busy) or Big Bend (a busy four lanes with a turn lane right past an intersection). I proceed to leave the Sulphur Springs way, look both ways there is no traffic, make a left onto SS and proceed onto Big Bend at which point I notice a police officer behind me. Hmm I think, he kinda just ran that light behind me.... didn't take long to find out why as a few 100 yards down Big Bend and his lights pop on and this is where I'm pretty sure I threw up a little. I don't get pulled over, I've only been pulled over twice my entire life and one time was not my fault (I'm talking to you Delanty siblings) and I don't do well with authority as we all know. I had a feeling it was either my headlight (but how did he see) or a rear corner light (I've got lots of light problems right now). *Please, please let it be a light. * Sadly, it was not a light. 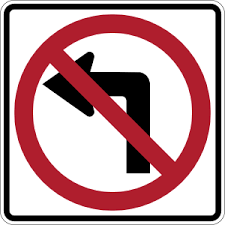 Apparently, you are not supposed to turn left across two lanes of slow traffic, but rather risk your life across 4 lanes (and a turn lane) on a very busy section of Big Bend to go left. I thought, ok, surely he will just slap me on the wrist, tell me not to do it again and send me on my way, I mean that must be the reason for my nice exchange with another SLC police officer moments before at QT, right? Wrong. Police Officer Kharma = FAIL. Only moments after he AGREED with me that it was more dangerous to turn left across all of the Big Bend lanes rather than where I turned, said he didn't understand the no left either, and all but admitted to doing it himself, he handed me a good old moving violation and told me to drive safely. DRIVE SAFELYYYYYYYY???!!!! Really, cause that's what I WAS DOING when you gave me a ticket for it and told me to instead risk my life and others crossing 4 lanes of busy Big Bend traffic. Yes, I did "fail to obey a no left turn sign" BUT I might have saved lives. Okay, I am being just a teeny bit dramatic, but tell me peeps - do I have any case here? (Also, the sign is kinda bent over to the left a bit, but in fair disclosure, is there). Also, any advice would be greatly appreciated. Is it even worth it to try and fight this or is it as black and white as sign/left turn? I think I know the answer, but damned if I'm not motivated to try. Happy Freaking Friday to me. Sorry, but this is pretty funny. Especially you Twilight fans out there. "Don't look at me - I'm bothered!!"